Not entirely sure how to use mung bean sprouts, I made a quick salad and tossed some in. They are amazingly crunchy! I could definitely get used to having them around more often at our dinner table. This is unfortunately the last week we have with Food Connect. We could easily become long-term subscribers and I can understand how subscribers become fervent supporters of this enterprise. It is not often a supplier makes the tangible effort to connect with its customers on more than the product level and this is possibly one of the most enjoyable purchase I've had. I have no doubt we'll be back soon to try out the other products Food Connect have to offer. you certainly got me interested in the vegie boxes idea. I'm not much of a vegie eater, nor do I have much imagination when it comes to cooking them. This might be a good thing to try and get in the act :) thanks so much for the informative reviews and pictures of what you get. Definitely give it a go. If anything, you'd be supporting local businesses and farmers, in exchange for fresher and potentially healthier produce at their seasonal peak with a smaller carbon footprint. 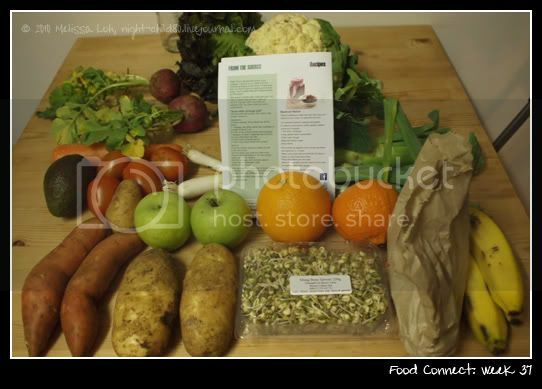 If you do decide to try out a veg box supplier, share your experience, cuz I'd love to see what other boxes might contain. Mung beans - yum! I tend to polish them off before they can get into a salad, but I have found mixing them in with a bit of cream cheese, grated chedder cheese, finely grated onion and fresh ginger to make a coleslaw is just lovely. i like the look of farm fresh central. just for the fact that i can pick and choose the types of veges/fruit/meat we want. might give it a try actually. can't wait to read your post about it. can't wait to read your post. we ordered $30 worth of fruit to trial it out and it's currently sitting in the gf's office. she's said the avos were gignormous and she sounds quite pleased with what we got. Can't wait to try them out!